MORRISSEY 25: LIVE is a legacy concert film marking 25 years of the solo career of one of the world's most iconic and enigmatic performers. Shot during Morrissey's most intimate gig in decades at the Hollywood High School in Los Angeles on March 2nd, 2013, the film opens with fans talking about their unwavering devotion to the singer and the unique appeal of this unusual venue a striking contrast to the sold out arena concert at the Staples Center on the previous night. Tickets to the concert in the 1,800-seater school auditorium had sold out in 12 seconds and this now legendary concert became Morrissey's penultimate performance on the US Tour. 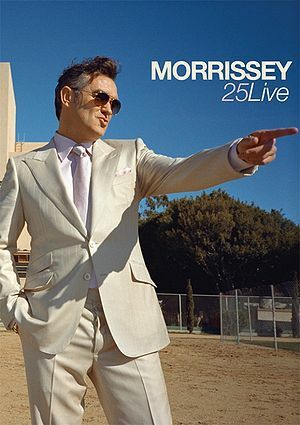 The first authorized Morrissey film for nine years and featuring many classic tracks from the artist's prolific repertoire, Morrissey 25: LIVE is an unmissable DVD release for fans worldwide. This page was last modified on 12 September 2014, at 17:22.